Robbie Brady after Ireland's 1-0 win against Gibraltar on Saturday. When was the last time we enjoyed a night against Georgia? 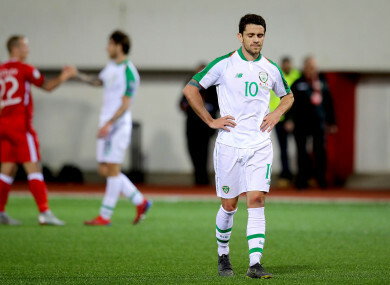 This is a third-straight occasion in which we find ourselves in a qualifying group with them, and the twin Uefa Nations League realities of their promotion and Ireland’s relegation means you can expect them to be coming soon to a League C near you. Given Ireland have played them so often – nine times since 2003, five of those coming in the last nine years – they are on the verge of moving from mere opponent to joining Macedonia as an Irish football adjective. To ‘have a Macedonia’ became slang for personal failure after Jason McAteer’s sending off in 1997, and was then expanded to include collective embarrassment after Ireland’s automatic qualification for Euro 2000 perished with the concession of a last-second equaliser against the very same opponents. To have a Georgia is a different thing, less defined by the act of failing than the realisation you have been slowly sliding toward it. Given it is a game we are expected to win while seemingly burdened by said expectation, it’s a name we can give those uneasy nights that are thin on glory and thick with possible humiliation; enduring a Georgia being similar to seeing in your younger, talented colleague not their talents but only your own, thwarted potential. Playing Georgia means assuming the role of confident protagonist, which means starting well, passing the ball with conviction, and, ideally, scoring a few goals. That hasn’t entirely suited Ireland in the last decade. While Ireland have only ever failed to beat Georgia once in their last eight qualifiers – the most recent, a 1-1 draw in Tblisi under Martin O’Neill – they’ve never really ever played well. Both Giovanni Trapattoni and Brian Kerr had their first competitive games in charge against Georgia, with those matches and the return fixtures all ending in wins. Kerr’s wins were better-received given that campaign began with the turmoil of McCarthy’s resignation, while Trap’s wins were unimpressive but at least allowed him to riff on his deep-seated opinion of the Irish squad. A 2-1 win at Croke Park, meanwhile, was gifted to Ireland thanks to a fairly ludicrous handball call by the Finnish referee that allowed Robbie Keane score a decisive penalty. So while his three of his successors/predecessors have all had their anxious nights against Georgia, Mick McCarthy never has having resigned in 2002 with a trip to Tblisi next on the agenda. He may experience his at the Aviva Stadium tonight. The last few days have given the manager enough to fret about, as his arrival did nothing to prod Ireland from their goalscoring torpor in Gibraltar. Ireland scored just once – and most troublingly, had just four shots on target – meaning the last time they scored more than one goal in a game was against Moldova in October 2017. The conditions were a mitigating factor – ambitions to switch play quickly to James McClean, for example, perished amid the unpredictable wind – but other than David McGoldrick, none of the attackers in the team made a significant impact. McCarthy admitted his experiment in playing Matt Doherty as an orthodox right-winger didn’t work, with Robbie Brady underwhelming as his replacement. While Doherty is unlikely to start in that position tonight, Brady’s presence from the start is no guarantee either. Having completed 90 minutes for Burnley just twice all season, McCarthy admitted after Saturday’s game that Brady wasn’t fit to play the full game. Sean Maguire said after the game that he didn’t involve himself in his first competitive start as he would have liked, with McCarthy saying yesterday that was partly the responsibility of the team for failing to play to his strengths. Shane Duffy is a doubt tonight because of an ankle injury and while McCarthy is optimistic he will be fit to play, he is comfortable with his options in reserve. John Egan is best-placed to make the step up, although losing Duffy would be a blow for Ireland, particularly as Richard Keogh plays encumbered with a broken hand. Jeff Hendrick and Conor Hourihane will continue in midfield, and although the former scored the only goal in Gibraltar his all-round game left a little to be desired. He was occasionally sloppy on the ball, and his shirking of it from Seamus Coleman on one occasion angered the manager on the touchline. McCarthy must deal with another issue, as off-the-field noise may elide with on-the-field matters amid rumours of in-game protests against John Delaney and the FAI. Reports of the chucking of tennis balls on the pitch appear to have been inaccurate, but there will nonetheless be an edge to the atmosphere with some fans planning to turn their backs on play at a point during the first-half. McCarthy’s last home game in charge ended in his being booed amid the hysterical fall-out to Saipan, admitting afterward that the negativity directed at him had affected his players. While McCarthy has asked fans to get behind the team – and Hendrick and Darren Randolph were insistent yesterday that any protests would not hinder the players – the whole prospect remains another cause for unease. Georgia, meanwhile, continue to improve. They won all but one of their Nations League games last year, and probably should have led Switzerland at half-time on Saturday, only to see Valeri Qazaishvili spurn a great chance. The Swiss, who were without Xherdan Shaqiri, ultimately made their class tell with a 2-0 win, but then they are more comfortable in these games than Ireland. Georgia, however, will feel that they have been long due a draw in Dublin, and with the Irish attack continuing to misfire and frustration latent among much of the crowd, tonight may well be the night they get it. Email “Goal-shy Ireland facing another anxious Aviva night against Georgia”. Feedback on “Goal-shy Ireland facing another anxious Aviva night against Georgia”.